I have ridden for many years, but it's only been in the last year that my riding has jumped to a new level of communication with my horse. The more advanced my riding becomes, the more I begin to experience the connection between "good riding" and the Reiki space. In reality, it feels like the same place, but it comes from a different angle. In my early days of riding, besides a few tumbles into the sand and dirt, I often experienced a sense of disconnect, of not knowing the "feel" of the right way to ask my horse to try this or that, or not understanding how to remain balanced in the saddle when moving from walk to trot to canter and back again. I found my arms and legs being jangled around like a rag doll and realized it was difficult to have clear communication with my horse. My mind knew what I was supposed to do, but somehow my body could not quite make the leap to follow. Every once in a while, however, at the most unexpected moment, everything would flow easily. Suddenly I could feel my center in perfect balance, the reins seemed weightless in my hands, and my horse responded easily, as if to my thoughts rather than my physical actions. It was as if time fell away and we were suspended in perfect harmony. This experience was so easy and yet so inaccessible; it seemed to happen when I least expected it and to disappear just as quickly. Issai Chozanshi described such an connection in the 1700s in Japan when he wrote, "The horse forgets the man, the man forgets the horse, and their spirits are one and do not go in different ways. You could say that there is no man in the saddle and no horse under it." When I began to experience this new connection in riding, I realized that I recognized this feeling from my work with horses and Reiki. 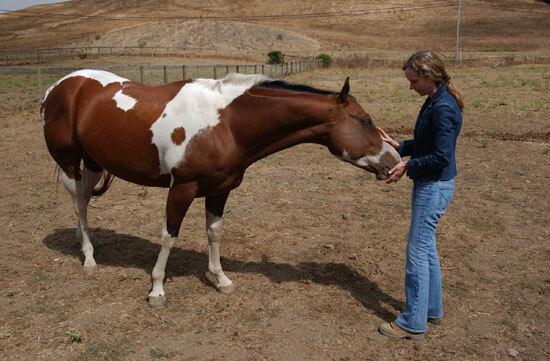 Sometimes I would be offering Reiki with a horse and suddenly all time and distance would fall away. Suddenly there would be only the horse and me, together and without separation. I would suddenly understand and know things about the horse without even trying. We would be perfectly in the moment and connected. Yet as soon as I would notice this (I would think to myself, "Wow, what is going on, this is cool!") I would snap out of it and be back in my "regular space" of being. The true and deep space of Reiki connection was somehow at once elusive but also very simple to achieve. As I began to reflect upon the similarities to good riding and Reiki, I realized that in an unexpected and amazing way, my Reiki practice was helping my riding, just as my riding practice was helping my Reiki. One helpful technique in my Reiki practice, which I believe has dramatically improved my riding ability, is the hara breathing. The hara is the energy center a few finger widths below one's belly button. In Japanese philosophy, this center represents one's "original energy" and connection to the earth. To be disconnected from this center is to be disconnected from one's center point of balance, one's roots, one's foundation. Since working with my teacher Frans Stiene, I have learned how to connect more deeply with the hara center (thus becoming more grounded and centered) through meditation and breathing techniques. At the same time that I found my Reiki practice becoming more solid, I found my riding becoming more centered and balanced. I found myself focusing on riding from my hara. When I am truly connected and centered at the hara, I notice that it is easy for me to ride in a very balanced state. It becomes effortless to let go and just "flow" in the connection with my horse. And so I can be walking, trotting or cantering; it all becomes movement within stillness and a quiet state amidst tremendous equine energy. Turning Inward and the "Ripple Effect"
Another helpful technique in my Reiki practice has been my habit of going inward rather than outward to connect with horses. In my early days of practice, I found myself trying to "reach out" to the animals I worked with. In my meditation practice with Frans, I have found that actually the opposite is much more effective: The more that I can let go of thinking about "sending" Reiki to this horse or that horse, the more I simply find my true quiet space within myself and the easier the ripple effect moves outward into a visible healing response from the horse I am connecting with. Amazingly, it seems that the more we try to "do" Reiki, the more our ego gets in the way. The more we simply let go and let Reiki, the easier it is for amazing possibilities to manifest! Similarly, when I want to ask something of my horse when I am riding, the more I bring my focus inside and visualize it happening, rather than actively pushing with my legs and arms to make it happen, the quicker and better my horse is to respond. Something else that I have been working with in my own Reiki journey is having the courage to face old fears in order to let them go and truly heal. I often find myself in a meditation when something from the past will come up and I will briefly wonder, "Do I really want to face this?" As you know, it takes a tremendous amount of courage for each of us to face things in order to release them and move forward in joy. But each time I just jump down the Reiki rabbit hole, and sure enough, find that there is peace and even joy at the other end. Similarly, I find myself sometimes becoming fearful in my riding. For example, learning to ride an extended (very fast and powerful) trot or to canter in a very small circle can be a bit intimidating. Feeling the power of 1,000 pounds of horse energy can make one feel suddenly very tiny. I might find myself wondering, "Do I really want to do this?" But I somehow find the courage to trust my horse and just "go for it!" It is a great feeling to work together in this way; sometimes I find myself riding with a big grin while my horse prances around in pride at what he knows how to do. Facing my fears in riding has helped me to gain confidence in myself and also builds the trust and joy between my horse and me. And so I continue to uncover the lessons that horses, Reiki and riding have to offer. I just keep working on it all. I know it will be a lifelong process in learning. But how wonderful to know that both disciplines can support each other!